Recently, I've been looking into the exploitation of use-after-free vulnerabilities. 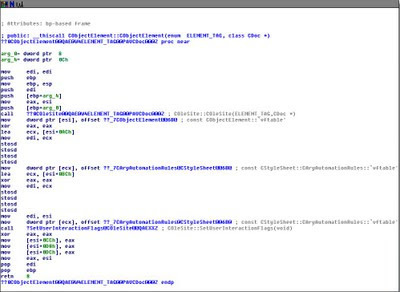 This class of bug is very application specific, but armed with just the right amount of knowledge these vulnerabilities can be exploited to bypass most modern OS exploit mitigations. After reading Nephi Johnson's (@d0c_s4vage) excellent article on exploiting an IE use-after-free vulnerability, I decided to ride his coattails and show the steps I used to analyze his proof-of-concept crash code. 6d55c402 8b5070 mov edx,dword ptr [eax+70h] ds:0023:00000070=???????? This is a classic C++ use-after-free vulnerability. IE is trying to call a function within a previously freed object's virtual function table. In the disassembly above, a pointer to some object [EBX] has a pointer to its virtual function table [ECX] that subsequently calls a function at offset 0x70 in its vftable [EAX+0x70]. BP mshtml!CTreeNode::ComputeFormats+0x42 10 ".printf \"Object Pointer:\\t%08x\\nVFTable Pointer:\\t%08x\\nVFTable:\\t\\t%08x\\nObject Type:\\n\", ebx, poi(ebx), poi(poi(ebx)); ln poi(poi(ebx)); g"
6cbfc402 8b5070          mov     edx,dword ptr [eax+70h] ds:0023:00000070=???????? As can be seen above, EBX points to a freed CObjectElement object. How can we know for sure that the object was freed and that it points to a CObjectElement object? Enabling the page heap and user stack traces of every call to malloc and free will do the trick. This technique also allows us to observe the size allocated to CObjectElement. BP mshtml!CTreeNode::ComputeFormats+0x42 12 "!heap -p -a poi(ebx); g"
6cabc400 8b01            mov     eax,dword ptr [ecx]  ds:0023:07c06f20=???????? The size that gets allocated to the CObjectElement object is 0xE0. It is also handy to see the call stacks of what allocated and freed the object. The size allocated for the object was determined via dynamic analysis. There's more than one way to skin a cat though. The same information can be gleaned via static analysis. A brief glance of the mshtml!CObjectElement::CreateElement function (which was called in the call stack above) in IDA shows that 0xE0 bytes is allocated for CObjectElement. According to the disassembly (for CObjectElement::CObjectElement), the actual size of the class is 0xDC. However, 0xE0 is allocated on the heap because the compiler rounded up the size to the nearest DWORD boundary. Lastly, although it is not always necessary for exploitation, let's determine the actual function that should have been called at the time of the crash. This can be accomplished several ways in Windbg. The function that should have been called was mshtml!CElement::SecurityContext. So to refresh our memories, what was needed to begin exploiting a use-after-free bug? 1. N. Johnson, "Insecticides don't kill bugs, Patch Tuesdays do,"
Actually, 0xDC is already "at the dword boundary". But the object size _is_ 0xE0. The last mov to [esi+0DCh] occupies offsets 0xDC to (not including) 0xE0. Noob oversight. Thanks for pointing that out. Awesome stuff :), I'm in the same boat, I have been researching this exploit and trying to get a good understanding myself. what is 10 after "BP mshtml!CTreeNode::ComputeFormats+0x42"
It skips over the first 10 breakpoints. I did it just to eliminate extraneous information about irrelevant objects. You Say: "As can be seen above, EBX points to a freed CObjectElement object. How can we know for sure that the object was freed and that it points to a CObjectElement object? Enabling the page heap and user stack traces of every call to malloc and free will do the trick. This technique also allows us to observe the size allocated to CObjectElement". Great question. I could have been a lot more clear in my explanation. You'll notice that the last object address before the crash is 00608808 which was used by some other object (mshtml!CPhraseElement) in this case. Notice that the last reference to address 00608808 referred to the CObjectElement instance. The example that follows simply shows definitively that the address in EBX was actually freed before crashing. Enabling the page heap is what triggered the access violation. Could you please let us know the exact version number of IE ? That I couldn't tell you. It's whatever version of IE was installed prior to KB2530548. 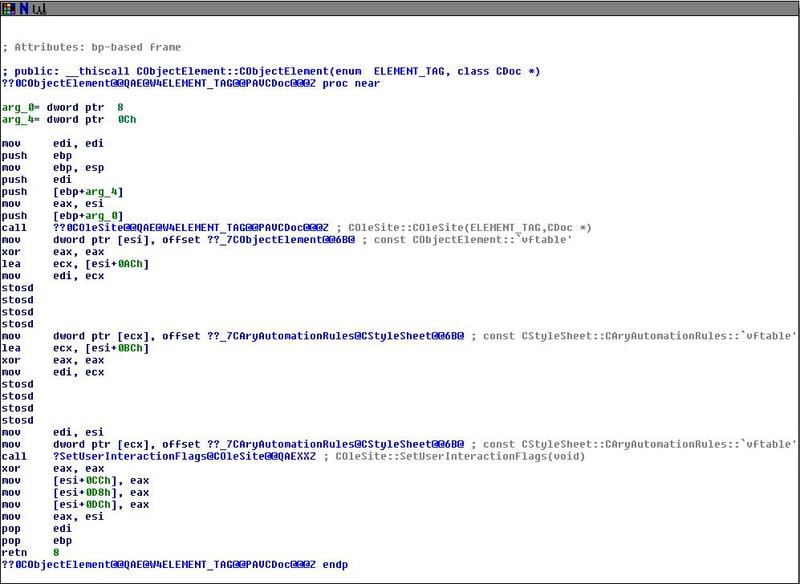 The vulnerable version of mshtlml.dll is also going to vary depending upon your OS configuration. how do we say that the [EBX] points to freed memory?